Consolidate, in the next 5 years, as a centre of advanced research relating research and training of advanced human resources specialized in chronic diseases, analyzing the two main problems of health for the population: cancer and cardiovascular diseases, to deliver relevant information both for prevention as a treatment as well as the reflection of public policy with respect to health". Be national and international reference in transdisciplinary research and training of human resources in chronic diseases, through the creation of expertise on the genetic elements, environmental and social which determine the development of cardiovascular diseases and cancer, providing prevention and treatment alternatives to influence health proposals and have a positive impact on the health of the people. Excellence in the development of research and knowledge generation for influencing the health of the population. Integrity as a guarantee of ethics and responsibility in their work. For the accuracy of the information to spread and transparency in the management of resources allocated to actions of the Center. Responsibility in the research of chronic diseases, incorporating the needs of the population. Collaboration, promoting team work and promote the work of specialists in various subjects, and with public health decision makers. Today, ACCDiS consists of 247 people working in 6 lines of research, MAUCO project and two support units. 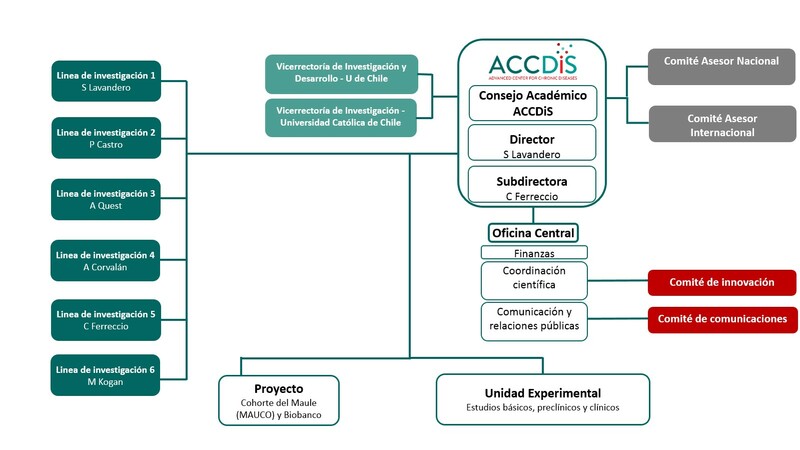 The Organization of ACCDiS includes also 6 principal investigators, 24 research associates, an administrative office, an academic Council, two advisory committees, one national and other international. Both Committees visit the Center on a yearly basis and make recommendations to improve the functioning of ACCDiS.